When Should You Not Close a Credit Card Account? Fed up with credit card debt and high interest rates? You're not alone, but if you think the best solution is doing away with your credit cards altogether, you may want to think twice before closing accounts. Canceling a credit card might make sense if you have too many or you can find a better deal, but there are certain cases when it may be better to keep the card. As Kenny Rogers sang, "You gotta know when to hold 'em, know when to fold 'em." It's a longtime credit card. Long-standing credit accounts look good on your credit reports and help boost your credit score. If you decide you must close a credit card account, choose the newest account to shut down rather than a longstanding account. You have no replacement credit card. If your credit card company just warned you of an upcoming rate hike, you probably want to tell the issuer to take a hike instead. Before you do that, though, shop around to see if you can get a better deal. Some credit card offers feature low introductory rates for the first year of an account or tempting deals on credit card rewards. Get that card in place before you cancel your other card. Why? Part of your credit score hinges on your credit utilization ratio--the amount of credit used compared to the amount of credit available to you. 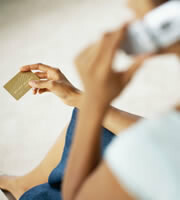 Many experts advise keeping balances on credit cards to no more than 30 percent of credit limits. Closing an account lowers your available credit and increases your credit utilization ratio, which could hurt your score. You have hefty credit card debt. If you decide you don't want a card but still owe a sizable amount of money on it, stop running up charges on the account and pay down the debt before you cancel. Under federal credit card regulations, credit card companies must give you a reasonable amount of time to pay off a card if you decide to opt out of the account because of a change in terms. But that credit card debt, along with the removal of the credit, increases your credit utilization rate. Finally, bear in mind that canceling a credit card does not remove the record of the account from your credit report. The account, along with your payment history, stays on your credit reports for up to seven years. If you decide to close a credit card account, call the company and talk to a customer service representative. Ask that the closure be reported as "at the customer's request," and get written confirmation of the closed account. 0 Responses to "When not to close a credit account"